Someone is killing all telepaths of S.H.I.E.L.D. Black Widow looks into the case when a close friend of hers also becomes victim to these serial killings. She finds out the killers, but they overwhelm her and take her away. 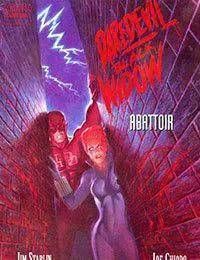 Daredevil follows.<br />Later, Black Widow awakens inside a slaughterhouse. She finds herself chained from the ceiling. What occurs before her eyes is sadistic nightmare. A female vampire mentally takes control of two victims and forces them to kill themselves.<br />Daredevil arrives, but his senses are jangled by the extreme cold outside. The vampire takes him down easily. Black Widow manages to free herself, but is caught in the vampires mental web. As Widow unwillingly brings a knife to her throat, Daredevil distracts the vampire. Widow stabs her dead.<br />But that is not all. Later, Widow requests to be left alone, because her thoughts are stained from the vampires telepathy on her.